For medieval theologians history involved not only the record of past events but also the calculation of time. The central event in the calendar, for them, was the date of Easter Sunday, but the date changes from year to year. It is the first Sunday after the first full moon following the vernal equinox. It is not hard to see how complicated figuring the date could be for people without computers, accurate timepieces and an idea of the correct spatial relationship of the earth to the sun and moon. They coped with the problem by keeping records and by compiling tables such as the one which folds out of this manuscript of annals or chronology of events from Selby. 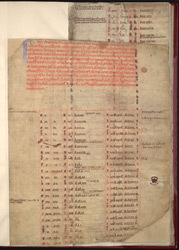 The fold-out has a copy of the table of the great Paschal Cycle for 1,596 years from A.D. 1. The paragraph at the top explains its use in calculating the date of Easter. Brief chronological notes in the margins give dates of the Emperors and Popes, events in English history, etc., and include the foundation of Selby Abbey in 1069 and the death of Abbot Germanus in 1160. The latest entry remaining is under 1183.